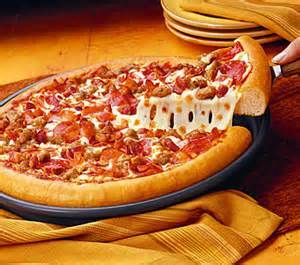 Cutting your pizza directly on the non-stick pizza pan will mar the finish. Always slide your pizza onto a wooden cutting board, and then cut with a pizza cutter. The above Use & Care instruction appears on almost all packaging for non-stick pizza crisper pans sold throughout the world. In order to avoid scratching the surface, and so damaging the pan’s non-stick release, pizzas must always be moved, with some difficulty, from the pan onto another surface for cutting and then serving. This can be quite inconvenient for the consumer, especially as pizzas taste best when just out of the oven and sizzling hot, so some care must be taken when moving them. The Lotus Rock Pizza Crisper Pan, on the other hand, has no such Use & Care instruction on its packaging because, like all other Lotus Rock cookware and bakeware, it is metal utensil safe. A standard stainless steel pizza cutter, or an all-purpose knife, can be used to cut and serve pizza directly from the pan, without any damage to the pan’s appearance or its long term non-stick release. Another significant benefit of the Lotus Rock Pizza Crisper Pan is its high heat resistance and heavy-gauge steel construction. Not only can it be used in a standard kitchen oven for a number of years, but because it has no chemical non-stick coating, such as PTFE, it can be used over an intense flame, such as an outdoor charcoal grill, without any damage to the pan’s quality. Moreover, because of its 2.0mm thickness the pan is very durable, will not warp easily and will hold its shape for long term use. In addition, a Lotus Rock Pizza Crisper Pan has an excellent heating effect which produces a pizza with a golden, light, crispy crust. The heavy steel gauge, with its dark matte, thick ceramic interior surface, retains and disperses heat within the pan extremely well to bake with a pizzeria-style texture and flavor. 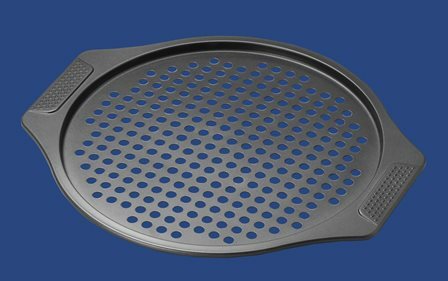 Lastly, the Lotus Rock Pizza Crisper Pan can also be used to bake other food, such as French fries, with uniform browning and crisping. Oven baking is considered a much healthier option than deep-frying, which allows large amounts of fatty oils to permeate the crust. Lotus Rock is PFOA/ PTFE free! Until the 1960s nearly all cookware in most households around the world was either cast iron, copper or stainless steel, with no coating on the cooking surface. This began to change in 1954 when Marc Gregoire, a Frenchman, applied a coating which contained a substance called PTFE (polytetrafluoroethylene) to a pan. This substance contains fluropolymers, which even to this day have been proven to have the lowest coefficient of friction (CoF) of any known solid. In other words, the majority of materials (in this case foodstuffs) do not stick to it. This highly significant breakthrough in non-stick technology would have far-reaching consequences because today three quarters of all cookware utensils use a non-stick coating containing fluropolymers. From the 1960s onwards this new PTFE-based non-stick coating was adopted by a company called DuPont, who gave it the brand name Teflon. It became a worldwide hit almost immediately among consumers who wanted a more hassle-free, easy-to-use cookware item. 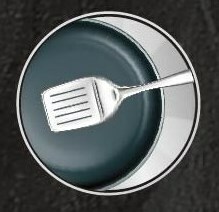 Unlike cast-iron or copper, Teflon didn’t need to be seasoned or continually re-polished, and in contrast to stainless steel, a large quantity of oil didn’t have to be used each time to stop items with a high protein content, such as eggs, poultry and fish, sticking to the pan. 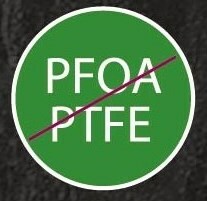 However, the Teflon brand’s credibility began to suffer later in the 20th century when it was found that a substance called PFOA (Perfluorooctanoic acid), which was used in the Teflon coating as an emulsifier to help the PTFE spread evenly on the pan surface, had serious health issues for human beings. 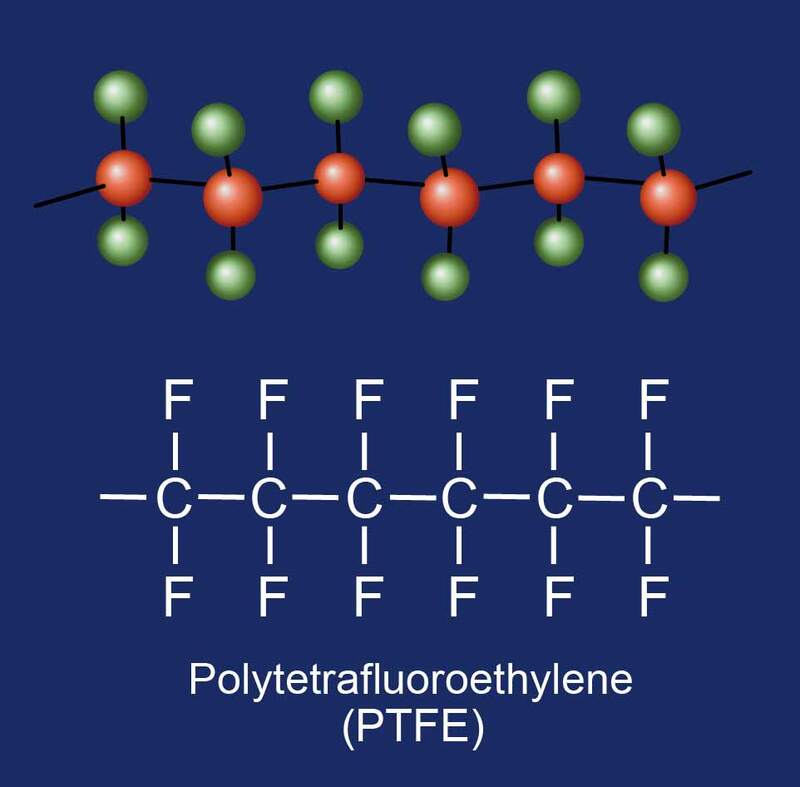 The negative publicity forced Dupont to remove PFOA from the Teflon formula, replacing it with another emulsifying substance, still unknown even today. At the turn of the 20th century controversy over PTFE non-stick coating continued as some medical experts produced reports which claimed that if it was heated to above 350 degrees then toxic fumes would be emitted and that these would be lethal to birds. These findings also led some to believe and suspect that these toxic fumes could be hazardous to humans as well. In addition to health concerns, the PTFE non-stick coating was also later found to have cooking performance problems. One of the obvious benefits of a PTFE non-stick coating is the fluropolymers which, as Marc Gregoire had earlier found out, are extremely stick-resistant to other substances around it. However, there is a flip-side to this benefit: within a coating PTFE does not bond well to itself, which means that this type of coating has a pinhole problem. This is a particular concern when oil is heated on the pan to a high temperature, as the oil molecules decrease in size and can then penetrate the coating. This can not only cause corrosion problems, but can also lead to the coating breaking up and peeling off – thus also impairing the quality of the non-stick release. 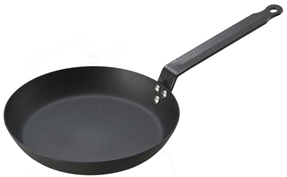 Lotus Rock, on the other hand, has a natural, durable non-stick release which contains no PFOA or PTFE. Because it has no PTFE all Lotus Rock pans have excellent heat and scratch resistance. A Lotus Rock pans can be heated to over 350 degrees with no chance of any toxic fumes being emitted from the surface of the coating. Metal utensils, such as spatulas or knives and forks, can all be used on the surface of the coating without any chance of scratching the coating and making it peel off. Moreover, because all Lotus Rock pans have an extremely thick, solid ceramic interior, up to 100 microns, they have, unlike PTFE non-stick coatings, no pin-hole or peeling off related difficulties. In the absence of flavorful ingredients, well-browned food has a richer, more varied flavor then poorly browned food. 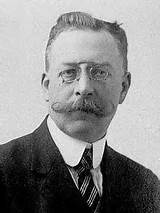 Browning is a chemical reaction, also known as the Maillard Reaction after the French scientist, Louis Camille Maillard, who first described the process in the early 1900s. 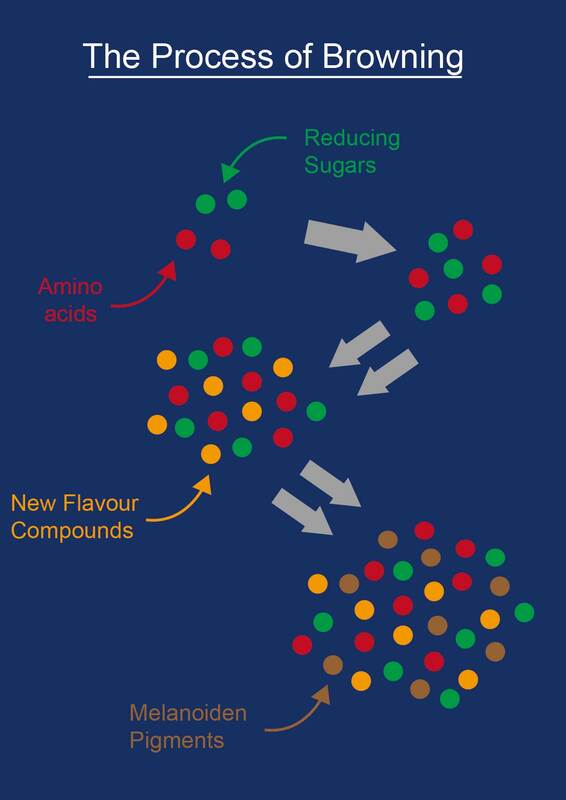 The chemistry behind this reaction is not completely understood even today but, put simply, in many foods heat causes the amino acids (the building blocks of proteins) to react with certain types of sugars to create new, distinct flavor compounds. These compounds in turn react with more amino acids to form even more compounds, rapidly increasing in quantity on both the surface of the cooking food and the pan itself. Finally, very large molecules called Melanoidin pigments are formed which create the deep brown hue on the crusts of meat and vegetables. 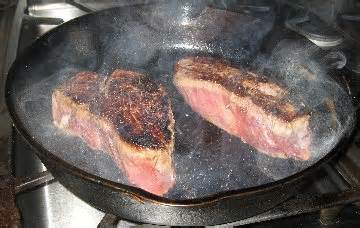 Sauteing and searing are generally considered the best cooking methods for giving meat, such as steak, or vegetables a well-browned, flavourful crust. In order to achieve this, a proper pan temperature is crucial for success. If the pan is too cool the foods may cook too slowly and virtually steam in exuded juices, preventing both crust and flavor development. The Maillard Reaction occurs only when the surface temperature exceeds 300 degrees. What is the best frying pan for a delicious, browned crust on food? Although aluminum and tri-ply stainless steel pans conduct heat around a frying pan very evenly, they do not conduct it to the surface of the pan very quickly. Significant heat is required to jump start the chemical reaction that causes food to brown; and longer cooking time, as with an aluminum or stainless steel pan, won’t lead to more browning unless the food is cooked for a very long time. However, if food is cooked for too long there will be large loss of moisture, so that that although the food might be well-browned on the outside, it will be too dry and chewy on the inside. Ultimately, a hotter pan equals more browning. Cast iron is excellent for this because it not only retains heat extremely well but also, once heated up, conducts heat to the surface of the food very quickly. However, for cooking usage cast iron does have some significant disadvantages: it is heavy, expensive, difficult to clean, and the temperature of the pan can be difficult to control. In contrast, a Lotus Rock pan shares many of the benefits of cast iron but is lighter, cheaper, easier to clean, and the pan heats up quickly too, but at a controlled setting, for excellent browning and flavourful crust development on food.